I never intended on being a guinea pig when I grew up, yet here I am, testing and experimenting again on your behalf! First, it was Zaycon and their famous boneless skinless chicken breasts. Next, it was Amazon and how to get the most out of a Prime membership. Then, it was Grove Collaborative and their affordable “healthy” products (which turned out not to be healthy at all). Once again it was Zaycon, with an updated review of their shrimp and steaks. And now it’s my honest review of Butcher Box, known for delivering grass-fed beef, heritage breed pork and organic chicken right to your front door. Never heard of Butcher Box before? Here’s what you should know. Butcher Box is a meat distributor. They are neither a farm nor an online grocery store. Instead, they work with a group of family farms and cooperatives in order to bring grass-fed beef, heritage breed pork and organic chicken to your front door every month. Look at Butcher Box like a farm liaison. 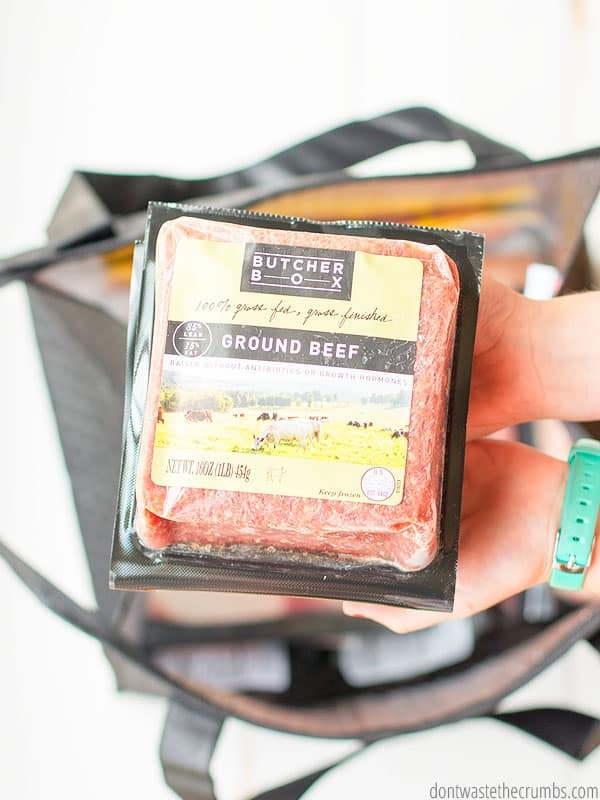 If you’re interesting in eating better quality meat but haven’t been able to find it at your grocery store or at a local farm, Butcher Box can provide it for you. 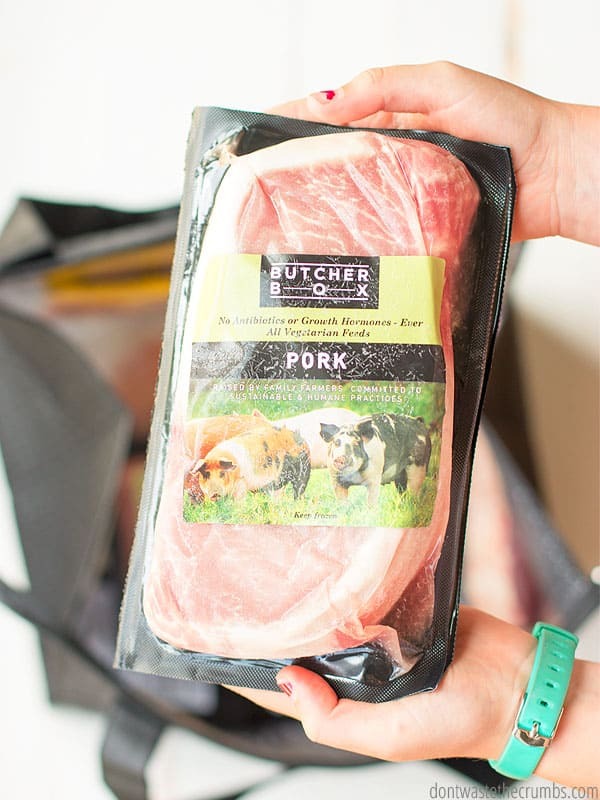 Butcher Box is a monthly subscription service. You choose what package of meat you’d like, how often you want the box delivered (either every month or every other month) and then choose any add-ons if you’d like. 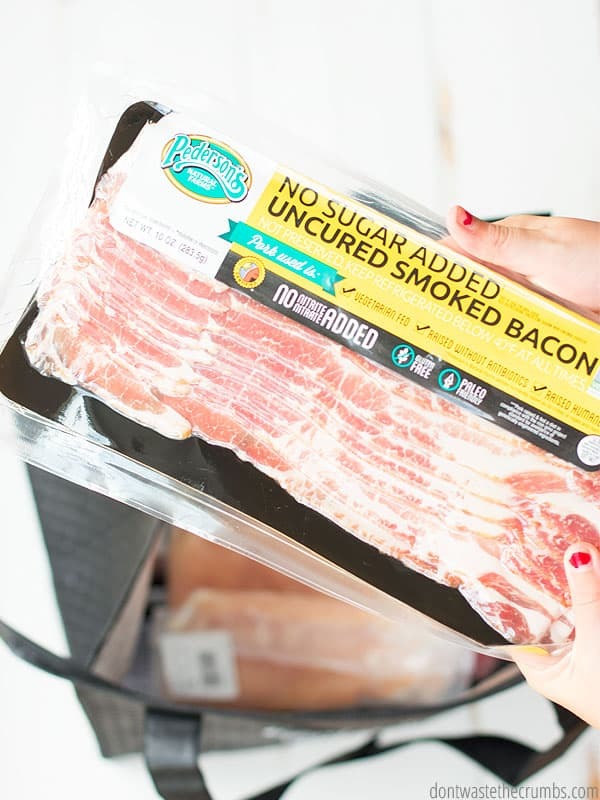 An add-on would be a one-off item, like a package of uncured sugar-free bacon or 1 pound of boneless pork chops. You don’t get to choose what goes inside the box for the first four options (Mixed Box, Beef & Pork, Beef & Chicken, All Beef). Obviously you choose the type of meat that goes in the box, but you don’t get to choose the exact cuts. 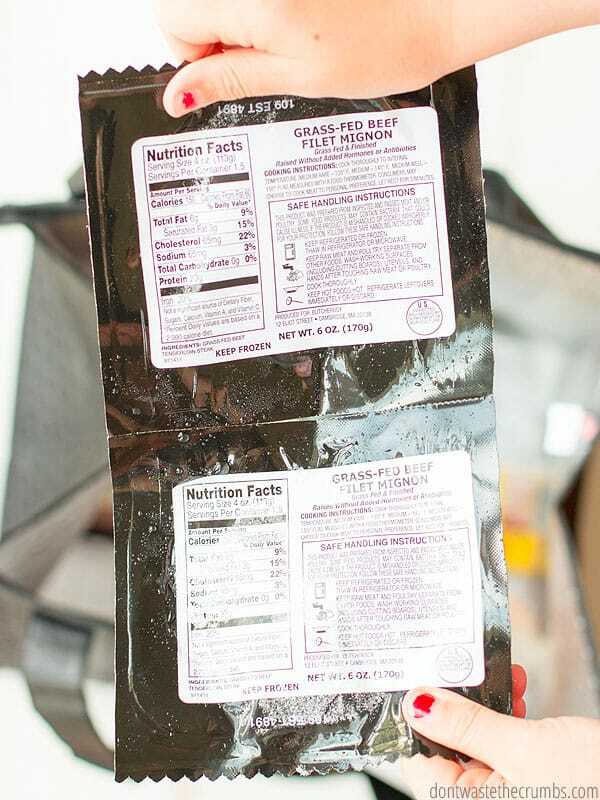 Each package comes in two different sizes: Classic (9-14 lbs of meat for about 24 meals) or Big (18-26 lbs of meat for about 48 meals). Butcher Box currently offers three types of meat – beef, chicken and pork – with the goal of bringing you the very best. The quality of the meat is pretty impressive, if I say so myself! The cattle are humanely raised, live their entire life on pasture and are never given antibiotics or hormones. They eat a natural diet of grass and they may be given silage or hay if the weather prevents them from grazing. The pasture-raised birds spend their entire lives foraging in the field with plenty of room to move around and interact with other chickens. Thanks to all this exercise, these birds will naturally be leaner than conventional chicken. The breeds of pork that Butcher Box sources have been specifically chosen for their rich color and marbled texture. There is no tail docking and the animals are either on pasture, or raised in open barns with bedding and space to engage in natural behaviors, as if they were outside. How Much Does Butcher Box Cost? This is a frugal food blog and no review can get away without discussing the numbers. Mixed Box / Beef & Pork / Beef & Chicken / All Beef: $129 for a Classic Box, $238 for a Big Box. Custom Box: $149 for a Classic Box, $270 for a Big Box. Depending on what is in your box and the size, it comes out to about $13.22-$14.35 per pound. If you check out their site, Butcher Box prices their boxes by meals, where 6oz equals one meal. This makes their pricing look a little different than the per pound price I’m sharing here. Yes, I know this is pricey. $13-14 for ONE pound of meat is nothing to scoff at, especially when you’re struggling to pay the bills AND put food on the table. However, it is VERY possible to eat healthy food without going broke. My family and I are living proof, and that’s why I started this blog. Your own real food priorities might not include grass-fed beef, organic chicken or pastured pork. Right now, you may be looking for the cheapest cuts of chicken you can possibly find. And that’s okay. I LOVE the idea of being able to choose the exact cuts of meat my family will have this month, but not for the $20 price tag. I’d much rather save that money and have a few flexible meals on my meal plan that will work with regardless of what cuts of meat I get. If you do choose the Custom Box, order cuts that tend to be pricey. Your cost for the box is the same regardless of what you put in it, so get the most by choosing pricier cuts you wouldn’t, or can’t, buy otherwise. Roasts tend to be bigger cuts of meat that aren’t quite as tender, and therefore aren’t as desireable, and therefore tend to cost less. Practically speaking, choose the 2.25 chuck roast or the 3.65 pork roast instead of the (2) 10 oz ribeyes – you get more meat that way. Don’t order things you know you can get locally. Instead, order the things you’re having a hard time sourcing. If your local store has organic chicken, then look at the beef or pork. If you can get grass-fed beef all day long, consider getting steaks or roasts. Look at how much you’re already spending on meat. A lot of people will scoff when they see the $129 monthly price tag, but they may not realize they’re ALREADY spending that every month on meat. Go through your receipts for the past month and categorize your spending like I did in this post. Then you’ll be better equipped to gauge whether the cost of Butcher Box is truly out of the budget. NOTE: I have students in my course Grocery Budget Bootcamp go through that exercise and they’re AMAZED and how much money they spend on juice, snacks and condiments. If you find a similar spending trend, perhaps these are things you can cut out to make room for better meat? Stretch the meat using real food. My ground beef taco meat recipe has just one pound of ground beef but easily feeds 6 at dinner (if not more!) and egg roll in a bowl uses just one pound of ground pork but we always have leftovers for a couple lunches! Soups and casseroles are great ways to stretch the meat too. Slow cooker pumpkin chili and chicken jalapeno popper casserole are a few of my favorites. Make stock with the bones. If you get any bones in your monthly box, save them for homemade stock! Here’s my method for slow cooker stock and Instant Pot stock. Save all of these kitchen scraps too and you’ll have incredibly delicious stock for FREE! 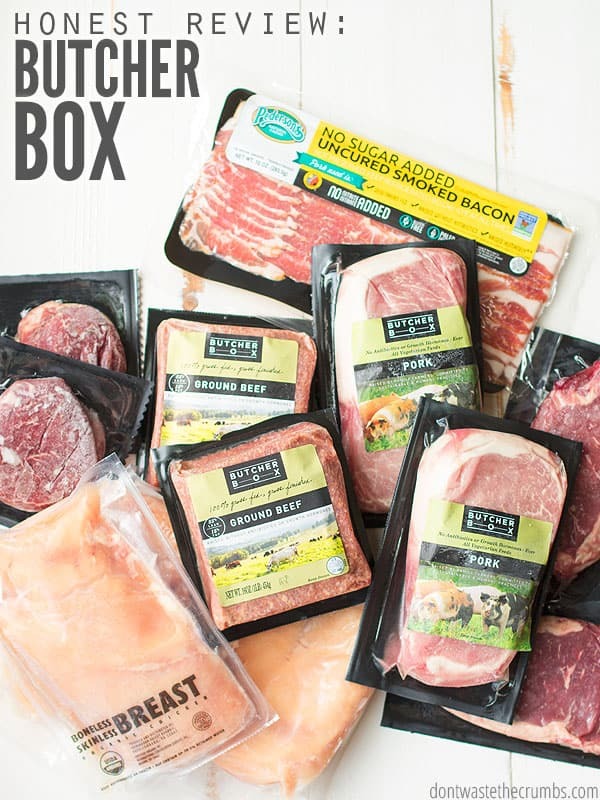 Butcher Box is offering Crumbs readers this exclusive start up: $10 off + FREE Bacon + FREE ground beef on your first order! As much as I truly love grocery shopping (I wouldn’t have created an entire course on how to eat real food on a budget if I didn’t! ), I have to confess that it’s really nice to have a box of high quality meat show up at my door. I personally enjoy the surprise of not knowing what’s inside the box. Since most of my meals are flexible (meaning I can substitute beef for chicken) or I can re-arrange my meal plan to accommodate what was delivered, I can make it work. To be honest though, when I opened our first box, I didn’t think there was a lot of meat. I took everything out and thought there was no way it would last us an entire month. There were a total of 12 packages of meat (including the free uncured sugar-free bacon) and each package weighed around 1 lb each. If I used only 1 pound of meat per meal and every time stretched it as best as I could (using the techniques mentioned above), I might be able to get 15 meals out of the box. At the time, this would have worked fine for my family. We ate meatless meals often, including soups, pasta nights, big salads and homemade bread in the meal plan regularly. Having meat every other day would actually be MORE than what we usually ate! Fast forward a few months though and I’m not sure it would be enough. We recently finished the Whole30 and really liked the difference in how we felt without eating grains, gluten, dairy or legumes. All four of us eat protein at every meal. Sometimes it’s eggs and sometimes it’s nuts, but most often it’s meat. Assuming we’re all eating four ounces of meat, three times a day, for 5 days of the week (which is being very conservative), we need at least 15 pounds of meat each week. 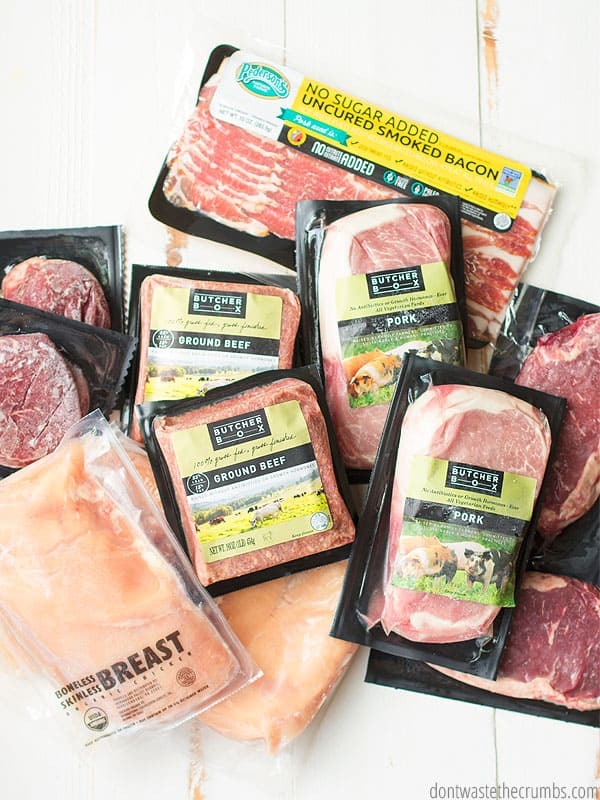 At $129 per box, that’s $516 on meat every month… and that’s also more than my entire monthly budget! On the flip side, the beef and pork from Butcher Box was absolutely delicious. I’ve purchased “natural” pork from the grocery store and every time it was tough and chewy. The pork from Butcher Box was nothing like that. Every pork chop was beyond tender and it made me wonder why we didn’t eat pork more often! Eating the steaks felt like a huge splurge for us since we don’t eat whole steaks at home often. We split two steaks for dinner to help stretch the meat (each steak was about 12 oz), but they were so good that both Mr. Crumbs and I wished we had a whole steak to ourselves! These same thoughts run through my head every time we try their meat… we’ve had their ground beef, rib-eyes, top sirloin, NY strip, pork loin and pork chops. Every time, it has been very, very good. The chicken was good, but because we’re committed to buying organic chicken anyway, we didn’t notice much of a difference. I would have liked a whole chicken to compare side-by-side since that’s what we have at home most often, but I intentionally asked for a mixed box instead. I did love knowing that the food we put into our bodies wasn’t void of nutrients. Grass-fed beef has more Omega 3’s, less Omega 6’s, and a higher portion of vitamin E, B-vitamins, calcium, magnesium and potassium. Mr. Crumbs has been struggling with some health issues that seem to be related to vitamins, so getting enough of the right vitamins naturally is important to us. We also had peace of mind that the food we were eating was actually doing our bodies good, instead of just being filler for our dinner plates. My husband and I both agreed that if were able to make it work with our budget, we’d definitely consider Butcher Box to source our meat. I don’t know if we’d be able to source ALL of our meat from them, but I’d certainly focus on the beef and pork since I can get good deals on organic chicken locally. The meat is shipped in an insulated bag, and then packed in an insulated box with dry ice. My box was delivered around 11am and when I opened it to take these pictures, the dry ice had melted but everything was still frozen solid (and two steaks sill had frost on them!). I then packaged it all back up and put it back on my front porch until 6pm – to mimic what it would be like if I didn’t work from home and it sat outside in the Georgia heat all day. When I brought everything back in, everything was still very cold. The very outer edges of one package of chicken wasn’t frozen solid, but I wouldn’t have any fear of not being home for delivery of my meat. I’ll be the first to admit that Butcher Box isn’t for everyone. Depending on where you are in this season, you might not be concerned about quality. Or perhaps you’re working on health issues and quality now tops the list of priorities. It’s entirely up to you, but I hope this summary helps if you feel on the fence. Are concerned about the quality of meat they’re eating. Quality is extremely important to Butcher Box, so that’s what they’re going to give you. As we’ve been working on my husband’s health issues, there’s a growing concern that the meat we’ve been eating doesn’t have as much of the vitamins that our bodies need to thrive. Cannot find a local source for grass-fed beef, pastured pork and/or organic chicken. I have friends who live nowhere near a farm and have very limited grocery store options as it is. For them, Butcher Box is a blessing because they wouldn’t have access to this quality of meat otherwise! Enjoy having someone else shop for them. 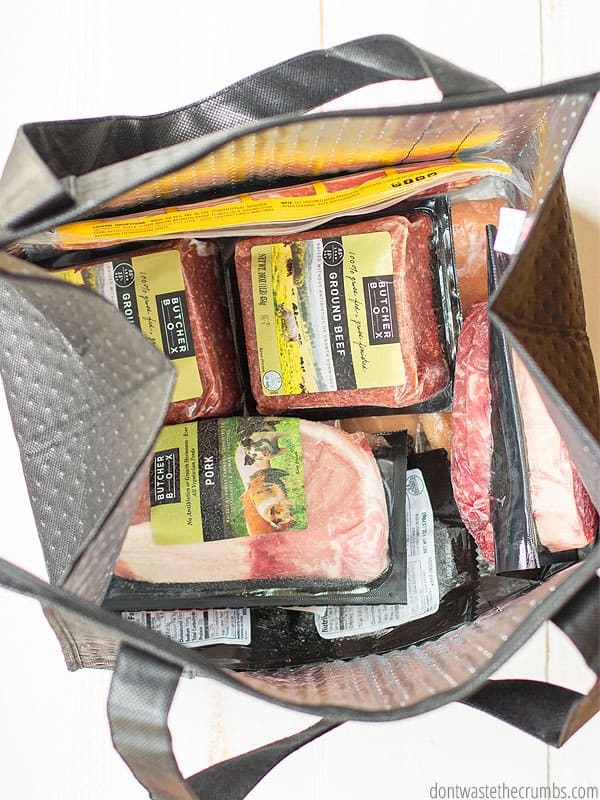 Not everyone enjoys grocery shopping and with a Butcher Box subscription, you can eliminate “meat” from your list every single month. Enjoy nicer cuts of meat. Your monthly subscription will by default include cuts of meat you likely wouldn’t be able to afford otherwise – that’s a good thing! Can get grass-fed beef, pastured pork and organic chicken from a local source (i.e. grocery store, CSA or a farm). I can consistently get grass-fed ground beef from Costco for $4.99/lb. I can even find it marked down to $3.99 at Kroger or Walmart! But I have never seen any other cuts of grass-fed beef locally. Whole organic chicken is just $1.99 at my local Costco, but the price goes up considerably if I look for organic cuts, especially chicken breasts, and some cuts (like wings) aren’t available in organic at all. Need to be more focused on the budget rather than the quality of meat. Everyone will be in this season at some point in time and there’s no way around it. If you are not in a place to financially afford Butcher Box, then say no for right now. Like to know exactly what they’re getting every month. You can choose the Custom Box if you’d like, but you don’t get to pick what comes in the other 4 boxes. If you’re particular about what cuts of meat you’re getting, this might not be a good fit UNLESS you choose the Custom Box. I encourage you to consider what your food priorities are and see if Butcher Box can help you meet them. If you decide to join, be sure to use this link to get $10 off + 2lbs ground beef + FREE BACON on your first order! Have you tried Butcher Box before? I’d love to hear your honest thoughts about the company and their service. Please leave your comments below for myself and your fellow Crumbs community to read! Thanks for the review of Butcher Box. I had heard of it but didn’t know it was a membership or how it worked. I have ordered from Wellness Meats and find the meat to be wonderful, but expensive. I’m going to see if I can figure out a way to compare it with B.B. You’re very welcome Katy! I’ve heard of Wellness Meats but also thought they were pricey. I’d love to know your thoughts if you give BB a try! Just received my first butcher box, received 30 pounds and some change of meat for 288 dollars, came out to around 9.50 a pound. Not bad considering alot of it are steaks. I found that the meat is high quality. The chicken and pork, especially, is better than I’ve ever had before. They have a good concept and product that (so far) generally works. My boxes almost always arrive frozen, however, in the hot summer months, I had a box or two arrive thawed, but all of the items were still very much cold. That was my biggest concern, as I’d read similar “thaw” stories online. There are several other services online that offer similar products, so we may give those a try as well. Thanks Tiffany! So I have done Butcher Box before. I tot loved the quality. I like you didn’t feel like I got a lot. And the portions are tiny. When I buy a roast I get a large one to have extra for more meals and to save time. I appreciate you sharing your honest opinion Michelle! I thought the portions were small too, but when I weighed the meat, it matched up with what it should be. I wonder if it’s because we’re using to seeing (and therefore, possibly serving) bigger portions on our plates? I know when I weigh 3-4 oz cooked chicken into my salad, it’s not as much as I’d like, LOL!! Have you increased your grocery budget since you are eating so much more meat now? Generally like you, I can get high quality meat for less than $9/lb. I love the idea of free bacon, though! The other day in the store, my 2 year old asked for bacon. I said, “Oh, you like bacon now?” Because he is incredibly picky and won’t eat meat. He said, “Friends come my house, eat bacon.” I realized we pretty much only buy bacon when we have people over, so he thinks bacon= company! Hi Tarynkay! I somehow missed this! It has gone up since we did the Whole30 back in February, but it’s starting to settle down now that we’re getting used to eating more Paleo. It’s up for sure compared to before, but it’s not extravagant! The free bacon has been icing on the cake for us LOL. It is also really convenient for our busy family, since the meat just shows up on our doorstep. When I go shopping, my focus is primarily on fruits and vegetables now. Agree! So far, we’ve had a really good experience. Glad they are working out for you. I never complain but this company has extremely irritated me. First the company did not have all of the meat in the package we ordered and sent a polite email stating they would be substituting for another type of meat. That was fine and I appreciated the heads up. When the order arrived, the substituted meat was nowhere to be found. We called and they issued a refund for the missing meat. While on the phone we decided to cancel our membership because we purchased a cow and no longer needed to order meat. The customer service representative informed us that our subscription would be canceled. My wife then logged into the account to verify it had been cancelled. This company does ot own up to their mistakes, they will not ever issue a refund no mater if it is clearly their fault and seem arrogant and rude. I will never recommend this company to anyone. Hey Jessie – I’ve had a great experience dealing with BB from my end and have even sent them some customer issues that readers have sent me. Have you tried escalating the issue to management? Sometimes that helps when you’re not getting the issues resolved at the customer service level. I’m so sorry you went through that. I had a slightly different experience. When one of my shipments was completely defrosted and warm (not sure if the box was damaged prior to/during shipping, or the ice was actually inadvertently omitted in packing), I received a new shipment very promptly. While the CSR was in a state of disbelief, as was I, they did rectify the situation immediately, which was the deciding factor for me continuing with this subscription. When I approach a new product, I like read a lot of comments before ordering, so I thought I would give a detailed description of my experience for those who like to get a lot of feedback. I apologize in advance for the length! I just ordered a custom box of Butcher Box, and here are my thoughts. There was a pretty good lag between when I ordered and when I got delivery, but I ordered right before a holiday (ordered on July 3). I wasn’t really in a hurry, so I was fine with that, but I didn’t like that there was no status update of where I was in the process when I logged in to my account. I had to do an on-line chat with someone for any details. My box arrived as I was headed out the door, so I dropped it in the house even though they say it will stay frozen for a long time. It’s very hot here in Florida, so not taking any chances. After I got home a few hours later, I opened my box and everything was still frozen. Yay! Everything looked like it was packaged in a high quality vacuum sealed package and the packaging was very done very well. Like everyone else, it seemed like less meat than I was anticipating, but it was everything I ordered. It all looked really good. I put most in the freezer, but thawed the bacon and two steaks. Having never eaten uncured bacon before, I wasn’t sure what to expect, but it looked, smelled, and tasted like regular bacon. If you like your bacon thinner, this isn’t your bacon. I realized I am not a fan of thick cut bacon. The steaks were good and tender. I don’t think they shrank much during cooking, so I probably could have shared one with my mother instead of each of us having one. Although they tasted good, I don’t know that they tasted any better than my typical grocery store steaks. I somehow assumed the flavor would be much better. I have chicken breasts and roasts in the freezer, but haven’t tried them yet. Overall, I am satisfied with my order, but I am not sure I will order again. What I loved most, was having my meat delivered right to my door and knowing that the meat is healthier and the animals were humanely treated. I might order once or twice a year, but I will probably seek out more local sources of similar products. It’s definitely worth a try at least once. Curious about the costs. The same Pederson’s bacon is $5.99 at my Wegmans in New York. That’s a big difference from the $9 price BB is charging. Thanks for the review, I really appreciate the details. I think it all depends Penelope. If you can find more affordable cuts locally, then I’d do that and only include the expensive cuts in your BB. I can get a great deal on organic chicken locally, but not grass-fed beef (beyond ground beef). So for me, a box with all beef would be a much better deal for my family. Just a heads up but although food labeled “grass fed” doesn’t mean it is grass finished , which is the most important detail when trying to purchase grass fed beef . I too, used to buy the Costco grass fed beef but it doesn’t say grass finished . So 5 dollars vs 9 dollars is probably why is so much cheaper . Thanks for the tip Sheri! I know that Butcher Box’s meat is grass-fed and grass-finished, but I’ll check the meat from Costco the next time I’m there! How do you know that B.B. beef is grass finished? If it is, it would be written somewhere being that it’s an important selling point? I would like to see grass-finished in writing. Is it on their labels? I have had butcher box for 4 months. The first box was a mixed box and was fine. The second box was the one where you choose, and the order as all wrong. The next box was correct, but I also received someone else’s box – a person I do not know. I tried to locate them but was unsuccessful. I tried contacting BB but it was the night before fourth of July. This month my box is totally wrong again. The customer service is terrible! The company tried to blame it all on me, even the delivery meant for the person whose box I got by mistake! I cancelled my subscription today. Frankly the aggravation is not worth it. Thank you for providing the detailed information to help people make educated decisions. I think your honest review is spot on. Especially your remarks about the pork. The first time I made their pork chops, my husband and I wondered what the heck we had been eating our entire lives. Although not inexpensive, all things considered, it’s a great deal – the delivery, the quality of the meat (not that easy for me to find the quality meat nearby or quickly), having a month supply on hand. I also agree if you’re going to go with BB – go with the pork chops/pork cuts or better cuts of beef – don’t go for the “ease” – i.e pre-cut chicken breasts labeled as “chicken tenders” or the stew meat. I did order their $10 recipe book and it had lots of good additional information about marinades and rubs and pros and cons of cooking methods for different cuts. We almost never eat out because I can’t eat corn and neither of us can have much salt and I don’t trust the quality of the oils in fats in any restaurant except the most pricey, so having high quality meat several times per week is our treat at home. I actually spent less per month on meat than with BB – but not because of budget reasons – but for the prices I was paying, the taste/quality was rarely worth it. Grass fed and heritage meats are different and worth the money. Have been with them for half a year – so far so good. I live in a building with a doorman and an air conditioned storage room for packages – so box never sits on porch/doorstep. Recently I gathered all the bags and dropped them off at a local montessori day care center and they’re being used to store toys and supplies. Regarding the salmon, I know it comes with the skin, but is the skin descaled or do you have to take the scales off yourself? Thank you. We have used BB for about a year. I have never weighed what I receive in the mixed box to figure cost/lb until this month. I have noticed less and less meat in my box. This month, I received 9.925 pounds, which comes out to about 13$/pound. Yikes. I have stopped my subscription for the moment, as I do have access to at least locally sourced beef and pork at a much better price. Disappointed though. Hi Rebecca! Several weeks ago I contacted Butcher Box with several of the issues mentioned in the comments in this post (not just yours), and their customer service team specifically reached out to every single person I was able to give them information on. If you haven’t already, please contact Butcher Box with ANY issues you might have. I’ve spoken to their customer service lead and improving their customer relations is one of their top priorities. As you know, they cannot control FedEx and sometimes boxes are at the very end of a long delivery route, but they are working on making customers happy even when these situations arrive. I personally purchased a subscription to Butcher Box and my last box came still halfway full with dry ice and everything was frozen solid – so much so, that I had to put on my kitchen oven mitts to handle everything because it was so cold! I just started Butcher Box. I used to get a box through a local farmer but her husband died and she sold the farm. That’s where I first tasted pastured pork, and and you know nothing else compares. My son is sales manager for a local CSA selling produce and they are working on adding meat. When they do I will go with them. One thing that I liked about the one I had before was that we could get chicken feet (the BEST for making broth), livers & other offal and already rendered lard. We’re going to continue trying Butcher Box but as soon as something is available locally we’re going with that. The company my son works for sources all their products within 150 miles of where we live and I’d prefer to support local farmers. They will also offer duck and lamb. It sounds like you have a great plan lined up Brigid! Just received our first butcher box order. Have tried the sirloin steak, chicken , pork chops and ground beef. Have been concerned about additives for sometime now and thought this would be a good way to steer away from them.So far the pork and chicken are my favorites. Eager to try the ribeye but since there are 3 of us I will probably make a steak salad with those as there are only two.Spending $130.00 at the grocery store is a cinch so the cost is fine with me . The insulated bag they sent is great and I added on burgers. I’m so glad you’ve found a solution to finding high quality meat Sandi! I’m on my second stint with BB. After the first delivery I cancelled right away because it was a day late and half of the meat was thawed out. I write them an email and expressed my dissatisfaction with my order and they refunded half of what I paid, no questions asked. This told me two things, 1- they rather make things right then go back and forth with customers, and 2- this must happen often. So I decided to give them another shot. The net delivery was on time and exactly what I ordered. (Custom box) The only difference was the brand of bacon which was different from the fist shipment. Everything was frozen when it arrived. As far as the quality and quantity. I think for what your paying for frozen meat it’s expnsive. My small family of 3 ( wife, myself and 10mo. Old baby) could go through a 149.99 box in 2 weeks if we didn’t eat out a couple times a week. Sure the cuts of meat seem smaller then your typical supermarket but if you consider the waste you have from grocery store cuts it equals out. In the cuts I’ve received from BB there was zero waste. Normally I was trimming fat, paying for the extra weight, and not consuming what we paid for. One thing I wish was more transparent is where the meat actually comes from. It would be nice if we as consumers could know a little more about the “farms” BB uses and their practices. Anyone can make the claims BB makes, who holds them accountable? They claim to have BB personal check package and put their stamp of approval on it, but I’m a little wiser and know that’s a bunch of bs. All in all, I don’t plan on continuing my subscription with BB. The taste of the meat is excellent for being frozen, and the customer service was good as well. I personally don’t see the value (even at 150 per month)especially with no concrete proof that the meat comes from where they claim. I’m going to continue look for a local farm where I can visit and see first hand what I’m paying for. I’m sure it will be significantly less as well. I receive a box from butcher box every 3 months. The meats are always frozen. The meats are delicious and even though I’m not really a good cook, the meat always turns out well. I get the beef/pork mix box. I also like the bacon. My daughter doesn’t eat pork because it makes her sick. However, she is able to eat butcher box bacon. I think it’s because there are no nitrates or nitrites in it. So far I haven’t had any problems with my orders. A few places near me sell grass fed or organic meats but they are not as good as butcher box. I appreciate you sharing your experience with us Betty! Outstanding article. Thank you very much for the time and effort. Very helpful and much appreciated! Some brands at Walmart that says “grass-fed”, well they only have to grass-feed for 20 days to be able to slap on that label. Check that out. I haven’t heard of this Debbie. Do you have any research links to back up this claim? I love my mixed BB and have never had any problems with packaging or my order. The meat, pork and chicken are all excellent. I love getting my surprise box every other month and feel so much better about eating animals raised this way. I appreciate you sharing your experience with us Kori! I’ve read the reviews as well as your article and I question the math involved. Let’s do the math. Let’s assume I buy the Classic Box and get a full 14 pounds of meat. My cost is $129 or $9.21 per pound (above the high end of your stated average). If I get the low end on the weight (9 lbs) that comes to $14.33 per pound!! It doesn’t get much better going to the Big Box where 26 pounds would cost $9.15 per pound and 18 pounds would cost $13.22 per pound!! Steve – I’ll revisit the math on this. BB has changed the wording on how they offer the boxes, so I can’t pull up the page I used to calculate this… I can however, update it to reflect the new BB page. Thanks! Hi Barbara! Several weeks ago I contacted Butcher Box with several of the issues mentioned in the comments in this post (not just yours), and their customer service team specifically reached out to every single person I was able to give them information on. If you haven’t already, please contact Butcher Box with ANY issues you might have. I’ve spoken to their customer service lead and improving their customer relations is one of their top priorities. I’ve received a few packages of meats that seemed more “thawed” than they should in the past. However, this past month I noticed they upgraded their insulation with stuff that was well over an inch thick. Everything was frozen solid, and this was a HUGE upgrade from their previous packaging. I highly doubt customers will have this issue anymore as it appears that they have resolved it. Like another reviewer said “quality over quantity,” this costs more (for less), but you can’t beat the quality. It’s worth it for us and we enjoy the product. However, the Butcherbox company is launching Smoothiebox. Their smoothies are TERRIBLE (and I don’t eat sugar), they messed up my first order, and customer service is unhelpful. Don’t waste your money on Smoothiebox, but Butcherbox is worth it. I appreciate this Angela! I haven’t tried their Smoothiebox yet, but hopefully it’s the jitters of launching something new! One clarification I’d like to make in that you describe “BB” as being “grass fed”, when they’re “grass finished” beef. I learned there’s a difference between the two in that YouTube channel host Thomas Delauer states the difference is that one can start feeding cows grass but at the end “finish” with grain, to include GMO, and still be correct in their description on being Grass fed. The grain is used to fatten the cow up. Hence the name “grass finished”. Thank you for your review and valued input in that we can hav save money by purchasing the items that are available locally. This isa good point. Another thing that lead me to try BB was whether their grass Finished beef had a gamey taste. I just got my order and will find out shortly. I purchased some grass fed beef from my local Wholesale meat distributor and the meat from New Zealand was gamey and my wife didn’t like it. I didn’t mind though… I was told this can vary from ranch and the type of grass the herd grazes on. Hey Dan! BB is actually grass-fed AND grass-finished. You’re right that there’s a difference! We ordered the Butcher Box large beef box just before Christmas. The delivery was delayed several days so I contacted the company and they checked and there was no UPS delivery date available in the system. Butcher Box immediately shipped another box to us for no charge. Two days later, I received the original order. All the dry ice was gone and most of the beef was a little thawed out. We tried some of the ground beef and it was delicious. We are still waiting on the second box but since Butcher Box treated us right, I just changed my order to the large custom box of beef, pork, and chicken. I look forward to a long-term relationship with Butcher Box….. Again, please note that they were very responsive and professional in dealing with my first order! We love Butcher Box Matt, and I’m so happy you’ve had a great experience with them as well! I ordered my first Butcher Box for the holidays and have to say the ham was outstanding!! I’m used to buying organic higher quality meats but often find it difficult to find higher quality pork. Wow, what a difference!! I haven’t tried the beef yet but the ham alone was a huge selling point for me. I also really wanted both grass fed and grass finished beef so eager to see if I notice a difference. Thanks for the info in your article, much appreciated! You’re very welcome Deborah! Just wait until you try the pork chops – GAME CHANGER! FYI BB does not give you the free bacon anymore. Now they give you 2lbs. of Wild Alaskan salmon, they did honor the $20 off your first order. I grew up on a farm and we raised our own beef, pigs and chicken and we would prepare them for the butcher they were raised on grasses and no antibiotics or hormones. Of course back then not much of that stuff in feeds yet so meat was very tasty. Looking forward to my first order I’ll let you know what I think about service and taste of my order. Thanks for everyones input. Hi Hermon! Every order comes with a pack of bacon, but you’re right – the current promotion is 2lb of Salmon. I’ll make sure we update this post with the most current information! Confused, that’s a box come every week or every month. So is it when 129 per week or month? Thanks for your review. Hi Stephanie! The prices are based on a monthly subscription. You’re very welcome! I only share products I personally use and love (and pay for out of my own pocket! ), so I hope you love them too!! BB really needs to offer more bacon as an order or offer for free with an order for life…seriously. Love your honest review!! I live in a very small town in west Texas and I’m a ButcherBox member. A drive to the closest big town is an hour away, so I appreciate that I can receive quality meat once a month delivered right to my door. I also feel better supporting a system that is supporting farmers with cleaner practices. I can totally see how this would help you out Jennifer. I’ve driven through West Texas a few times and there’s not a lot out there. How wonderful to have this delivered to your door! I tried this for a couple of months. I found the packaging to be a problem. I thought I had somehow poked holes into the package but it seems I had several items that came that way. I’m single, so it’s just me in the freezer. I only used about 40% of what I received after 2 deliveries. When I canceled online one of the reasons I could select was packaging which makes me think they are aware of it. I’m not accusing anyone of doing something wrong but after I defrosted in the fridge a few items and had a plate full of juice I realized the problem. I found a few other packages in the freezer had small holes and I tossed it all to be on the safe side. If they are aware of this issue I hope they find a way to correct it. Your site is awesome for information! Keep it up. Hi Ted! The company is based out of Massachusetts, but not all of animals are raised there. They work with farmers outside of the direct area as well.